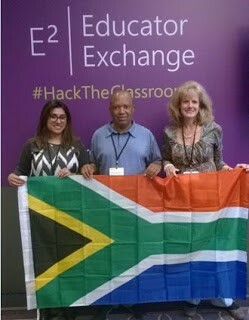 In previous issues of the SchoolNet SA newsletter and on this blog or our website you may have read about some of the current Microsoft Innovative Educator Experts and the opportunities they have had to attend the E2 Educator Exchange in Budapest or the Global Microsoft in Education Forum in Dubai. If you are using Microsoft technologies in innovative ways in your classroom, apply to be a Microsoft Innovative Educator Expert, and you too may have the opportunity to experience professional networking events and collaboration with other innovative teachers from around the world. Microsoft Innovative Educator (MIE) Experts are global visionaries who pave the way in the effective use of technology for better learning and student outcomes. They help Microsoft to lead innovation in education and they advocate and share their thoughts on effective use of technology in education with peers and policy makers. They provide insight for Microsoft on new products and tools for education, and they exchange best practices as they work together to promote innovation in teaching and learning. If you think you’ve got what it takes, applications are now open for the next round of the Microsoft Innovative Educator Expert program. Find out more on the Microsoft Educator Community and apply by 15 July 2016. Traditionally girls don’t choose IT as a career path, nor do they take IT as a subject. 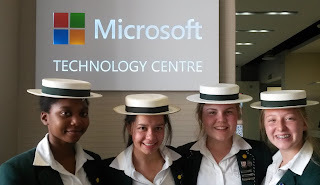 As part of the Microsoft Showcase Schools program, Brescia House School Microsoft Student Ambassadors Teaghan Lucas, Nikita Lledo, Munashe Mujaji and Kristina Heynes , were tasked to run a project to promote IT. 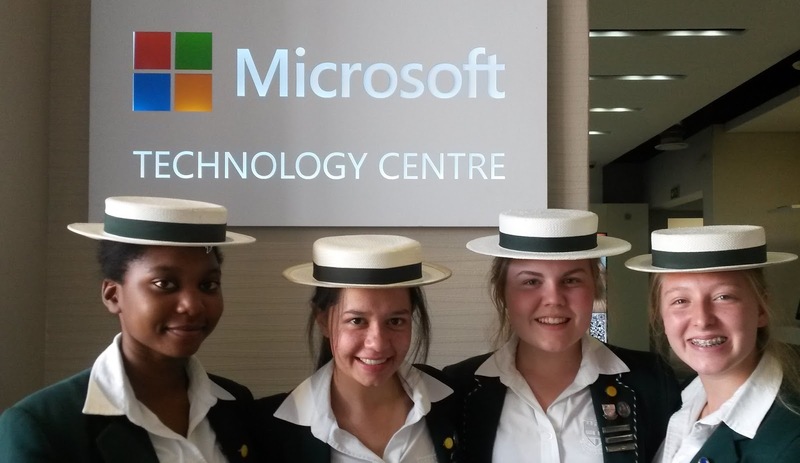 On 25 May 2016 the Brescia Microsoft Student Ambassadors hosted a networking dinner for grade 11 girls who are taking either IT or CAT as subjects. The girls were seated with women from the IT industry so that they could find out more about professions that use technology. In addition to networking, the audience enjoyed a talk by Lori Milner on building a personal brand and a presentation by Amu Mombedzi on Girls Who Code. 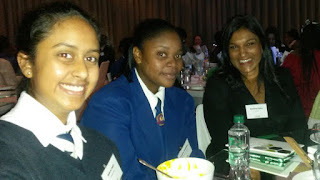 Omashani Naidoo and Megan Rademeyer attended the dinner and had the delight of chatting to girls from a range of different schools across Gauteng and beyond. It was heart-warming to meet intelligent, thoughtful young women who are excited about using technology and to hear about their career aspirations and study plans. The United Nations Framework Convention on Climate Change is seeking youth between 18 and 30 who are working on community or social action on Climate change. Why don’t you consider a project or campaign you are involved in to combat climate change, an action which convinced your parents, school or college to take climate action, a lobbying of your elected members of government or your city leaders. Whatever is making a difference, turn it into a snappy concise 3 minute video and join the competition. You could win a trip to Marrakesh. If you are between the ages of 18 and 30 we want to hear about your inspiring actions. Think about a project or campaign you are involved in to combat climate change, an action which convinced your parents, school or college to take climate action, a lobbying of your elected members of parliament or your city leaders. Whatever is making a difference, turn it into a snappy concise 3 minute video and join the competition. • Why did you choose to engage in this climate action? • What were some of the key things that took place? • What were some of the successes? • Where did these successes occur (locally, nationally or internationally)? • How can youth from similar countries replicate the activities that have been implemented? • Position as a youth reporter for COP22/CMP12, responsible for assisting UNFCCC Newsroom team with videos, articles and social media posts. - You have organized a successful divestment campaign. The competition is open to young people between the ages of 18 and 30. To submit your video, and learn more about the Rules and Regulations go to www.tvebiomovies.org. The Global Youth Video Competition is collaboration between the United Nations Framework Convention on Climate Change (UNFCCC), the UNDP GEF-Small Grants Programme, the United Nations Joint Framework Initiative on Children, Youth, and Climate Change and Television for the Environment. Have you ever considered getting your class to write a 'Choose your own adventure' story? This type of story was very popular in past times. Basically it is a story that has different endings based on decisions that were made. The reader can choose the ending they like the best. Writing a story like this encourages students to think 'What if' about situations, and they are made aware of the realization that most decisions have consequences. This type of story works really well when you use PowerPoint or Google Slides. Let's look at some posts and stories shared by teachers around the world on how they tackled the process digitally. This is a great post by Rolland Chidiac showing how he went about getting his class to write these types of stories. 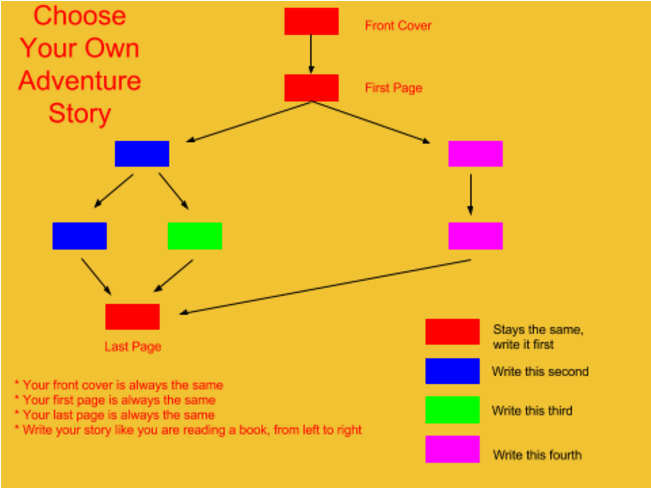 He has a blog where he outlines the process in more detail: http://goo.gl/mFkq1i I rather like his story structure diagram that he shared with his class. Sylvia Duckworth has tried this process using Google forms, Google Docs, Google Slides and YouTube annotations. She gives a useful diagram on how the story could be structured. 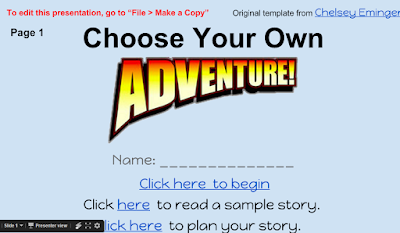 Jonathon Wylie also showed how to get going in all four applications (Slides, Docs, Forms and YouTube annotations) on his blog in a post entitled 'Creating Interactive Choose Your Own (Google) Adventure Stories' https://goo.gl/zcNHZq This is what he says about Google presentations: “Want to try something different? Try using Google Presentations. Instead of creating pages, like you would with Forms, you create slides to tell your story. This gives you a little more flexibility in the visual design of your story, but it also opens up more options in terms of the media you can include…namely video. Slides can be linked together via the link function that you may normally use to insert a hyperlink, only this time you select 'Slides in this presentation' ". 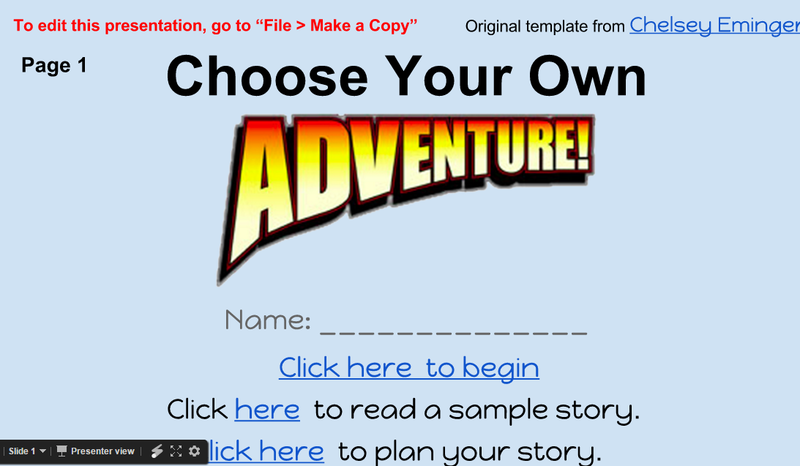 Tony Amsler gives detailed instructions on this process on a Google Sites page entitled, “Choose Your Own (Google) Adventure Stories” He demonstrates the story by creating an example about copyright! Decide on an assessment rubric and show it. I've always been interested in learning about thinking! For example, information on how the brain works, using concept maps in the classroom. study skills, making thinking visible and more. I know that when kids have structure for thinking they learn better. What I didn’t know, though, is that that there is a whole movement in schools aimed at encouraging thinking in the classroom. I stumbled on to this recently when I received an email inviting me to register for the Future Ready Roadshow in Cape Town. When I saw that James Saunders from the USA was to be the keynote speaker, that was enough for me - I lOVE his presentations.. This conference was hosted by the Thinking Schools Association of South Africa. Edutopia has a great post called ‘Integrating the 16 Habits of Mind’. 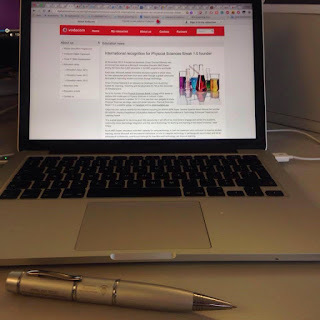 http://goo.gl/vLrMl showing how to integrate these habits into the classroom, in whatever you do. The first session involved visiting a teacher who was teaching a class in a way that encourages thinking. It was a Saturday, but the classes doing demonstrations had come to school! I opted to go to a Grade 3 story-writing class. Before writing about that as a takeaway I want to mention the use of graphic organisers to promote thinking. The Grade 3 teacher had these thinking maps displayed on her wall. She mentioned that she frequenty brought them into her lessons, all depending on what the lesson wanted to achieve. I loved observing the story writing lesson. The teacher did this in three steps. The first step was on the mat where the learners used the circle map to discuss their favourite books in the library. After that the class set about their task which was to create a collaborative story based on the words written on a card. They each selected an envelope which contained a card (all the cards were different) and they set about writing their story. The second step of the task was for them to discuss and record ideas using the most suitable thinking chart. The third step was for them to plan their story using the best chart for their purposes. The observers went around listening, noting which thinking map they had selected and watching the progress of the task. I loved watching the engagement in the groups, the use of dictionaries and the ideas that just flowed. All too soon it was time to go to the next sesion so we couldn’t see the last steps of putting their ideas into story form. The teacher said that in the end they would each write their own final rendering of the story. It was a great experience being in the class. We were taken on a tour around the passages of Grove Primary. Wherever we went we saw children’s work using thinking maps displayed on the walls...every kind of thinking map imagineable from Grade 1 - 7. It was very impressive. This was an incredible keynote. Do you know that James spoke for 1.5 hours but held us spellbounds! It felt like 5 minutes. He brought so much variety into his talk - videos, podcasts, music, quizzes, discussions, etc. It was just an incredibly motivating talk. The keynote was titled ‘Chasing unicorns - everyone has a resume of failure'. He spoke about his various failures and how he had tackled them and in many cases they have led to incredible success. We talked about the importance of facing our biggest fears. We were encouraged to "take risks, reimagine, put yourself out there." Using Socrative.com we shared our biggest professional goals, anonymously. James has started many successful ventures with his creative thinking but the two I’ll mention are Breakout and Future Ready Schools. Future Ready Schools (http://futureready.org/) He was one of the people selected to present to President Obama - he presented his Future Ready concept which was already popular. It was then endorsed by President Obama and in the USA along 26 million students are experiencing the future ready approach. Future Ready Schools helps district leaders plan and implement personalized, research-based digital learning strategies so all students can achieve their full potential. We really enjoyed listening to the Speed dating panel. They each gave an overview of what was happening in their school and then they answered questions from the floor about how they manage ‘thinking routines’ in their classrooms. There were many other interesting sessions that I haven't mentioned - these were just six highlights of many! It was a great day of learning for me and I have certainly become more aware of the different ways of encouraging thinking in the classroom...and the importance of taking risks! For the second year now, one of our classes has participated in the 24-hour Skype marathon hosted by Beverly Ladd and her Grade 2 students from Pine View Elementary in Wilmington, North Carolina, USA. This year it was the turn of the Grade 5 Pelicans class and as before, it was a huge success! Beverly started planning this all months ago – I received an email from her in October last year already, and once I had identified a class to participate in the Skype marathon (Skypathon). How do students at your school get health care, education, and access to clean water in your community or country? Does your community or school receive support from any groups or individuals (i.e. school supplies, volunteers, financial support, etc.)? How does this make your community or school a better place. What do students at your school do to help protect the Earth? What could students at your school to make a greater impact? How can we positively take action and make decisions that support and nurture our environment and animals? What other global issues affect your school/community/country and how can you make a difference now and in the future? Teach or show something that is unique or special about your culture or your state/country that others should know. On the day we were blessed with a crystal clear connection – even the visuals were clear. We were very thankful for our upgraded, fast and efficient fibre internet connection. We took turns to share the answers to our questions. We were interested to learn that their communities face many similar challenges as the communities here in our area, such as poverty and homelessness. We found it interesting that they have doctors and nurses at their schools so they can get medical care there, if necessary. A highlight for us was when the US students sang their National Anthem for us. It was very moving – especially since they were about 20 hours into their 24-hour marathon! 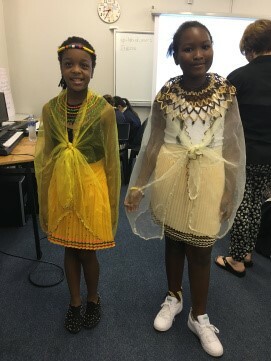 Our students greeted the US students in all 11 official languages and then two of our girls showed them what traditional Zulu dress looks like. I am now being pressured by our students to host our own Skype marathon, but I’m not sure if I’m up for a 24-hour stint. Twelve hours seems a good starting point. Watch this space! You’ll find a number of Skype lessons on the Microsoft Educator Community at http://bit.ly/1VizGOL. Once you are signed in on the Microsoft Educator network type 'Mystery Skype' into the search bar to find teachers wanting to set up a Mystery Skype collaboration. Mystery Skype is when two teachers set up a Skype experience between their classes. The classes have to guess each other's location. If you are a teacher who likes to be innovative in the classroom, think about entering Microsoft's Innovative Teacher MIEExpert program in 2016/2017 when applications reopen later in the year. You can learn more about the program at this link: http://bit.ly/1H4gKcB on the Microsoft Educator Community. 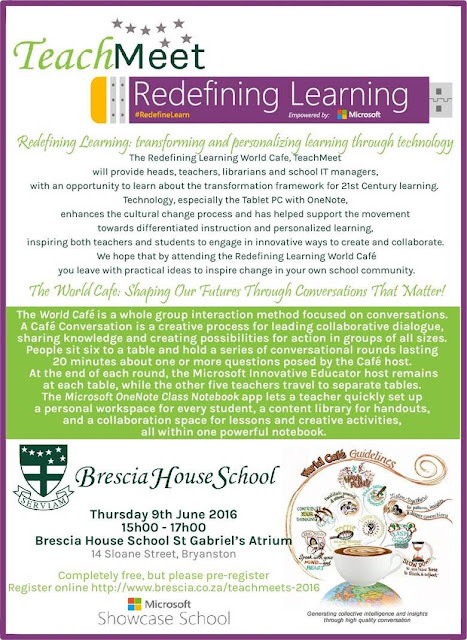 Brescia House School in Johannesburg is having another one of it's wonderful TeachMeets on Thursday 9th June at 3pm. Please visit their website at http://www.brescia.co.za/teachmeets-2016 to register. This is an opportunity for teachers, librarians, coordinators, heads & IT managers interested in innovation in teaching & learning to learn and share classroom ideas. This statement is according to the Education Policy Unit, University of the Western Cape and the International Development Research Centre 2000. Most parents all over the country, regardless of their backgrounds, own a mobile device. This can play a vital role in enabling science learners to access content. The interest in learning using personal mobile devices (PMD’s) by learners is growling daily. Most learners in high schools belong to social media platforms. If science content is advertised on social media it can encourage learners to explore the recommended sites. 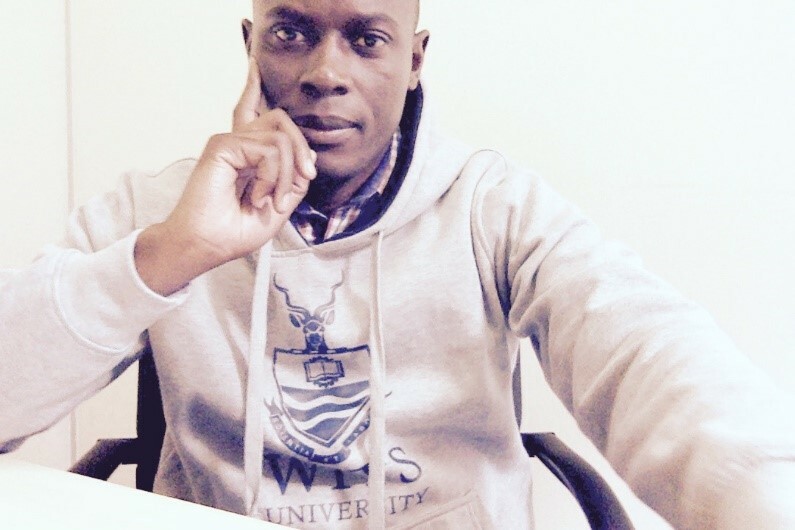 Coming from an under-resourced school in Limpopo, myself, I believe that we could greatly assist educators by providing access to online scientific content. This would greatly improve teacher motivation and would probably increase the enrolment in mathematics and science in those areas. Occasionally learners from the under-resourced areas perform to a satisfactory level in this subjects, but if they had access to the right online resources this would improve steadily. There is an increase in the availability of online science content, ranging from websites and blogs to apps and add-ins etc. The advantage in this is that most science tasks that were once considered difficult to explain, can now be easily and freely accessed and understood by usingapplications such as YouTube. Other educational science content created by experienced science educators in the country can also be made available online. We should encourage online collaboration and dsicussion. 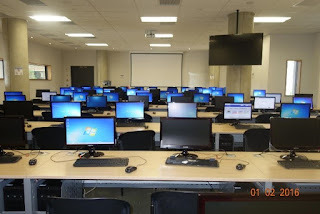 Learners in under-resourced schools use Facebook, for example, as much as learners of their age in the more resourced areas, Group discussions for mathematics and science can be escalated by using Facebook, Pinterest, Instagram, WhatsApp and other platforms using ICT. ICT has changed the way science and mathematics can be taught and learned. Let's use it to raise the standards in our under-resourced schools. Five takeaways from a most enjoyable Cape Town Maths Day! This was presented by Lynn Ross, the Matific Country Manager. Lynn Ross opened the Matific presentation by enquiring about how teachers felt about using technology in the classroom. The majority felt very nervous about it. They felt their students knew more than they did. Mathific (https://www.matific.com/za/en-za) is a great online Maths program linked to the South African CAPS. It's also available as an iPad or Android app. There is a 30 day trial and a membership costs R120 per year per student. It caters for Grades R - 7. The terminology used for getting around the website is episodes, worksheets, playlists and lesson plans. Here is a screenshot from the Grade 5 category on the website. This was a great presentation from Lynne Ross - very impressive. I liked this application very much. Below is a slideshow of some of my Matific screenshots. This session was presented by Tal Moore, Calculator Support Specialist. This was also a great session. We opened our wonderful calculator gift and played a lot of games one could do in the classroom - drill, tables etc. It really was a fun experience. It made me realise that a teacher can make Maths a load of fun in the classroom. Here are a couple of the tweets I made during the session. This session was presented by Steve Sherman, who calls himself a Chief Imagination Officer. This was an amazing presentation. Steve Sherman from Living Maths is a invigorating, entertaining presenter who really held everyone's attention throughout. He spoke on gamifying Maths and showed us what fun this process is. This is the first time that I have looked at The Living Maths website, and I discovered that it has so many generously-shared free resources to use under the Resources section. Today's resources were shared via a Symbaloo at https://goo.gl/7kmcJr (This can also found on the Resources section). We played Jeopardy, Who wants to be a millonnaire, Kahoot and Plickers, all adapted for Maths. Steve Sherman is also a great photographer and he took loads of photos which he has uploaded to an album on the Living Maths Facebook page https://goo.gl/vKv1qD. SchoolAdvisor allows schools to search for, get quotes and rate education suppliers directly. They believe this platform will help you to find the best supplier/product/service to meet your particular need and ensure that you receive the best service - as suppliers are kept accountable by constant reviews and feedback from school decision makers. They have a great competition going at the moment for the prize of an iPad Pro. There is a post about this on the SchoolNet website http://goo.gl/2OhCpI. Duncan Smith from School Advisor took us through writing a review on the SchoolAdvisor site https://www.schooladvisor.co.za/. The final presentation was from a Grove Primary teacher, Brian, who showed us how he uses Mathific in his classroom. Then...a lucky draw for a R500 voucher from School Advisor and the day was over! 9am - 11.30am! It was short and sweet but a day well spent.